How important is army for a state, both for internal and external affairs? Does the greek state have geostrategic interests? Has the greek state expansion tensions/strategies? How old and stable are these strategies, do they change whenever the government changes? 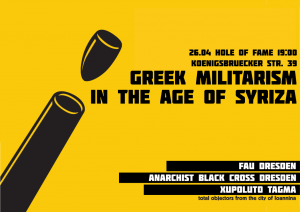 Examples of greek militarism in the age of Syriza. Greece’s role in war of Syria. The involvement of greel army in detention centers.